Can you for a moment imagine a situation where our next Prime Minister of Pakistan becomes Benazir Bhutto a person who was found utterly corrupt not once but on both times she was in office, to now plan for a return to lead us for yet another stint as the Prime Minster of Pakistan. Have we no other person in Pakistan to be willing to take this job, and have to resort to being represented by a leader who is corrupt beyond doubt, she may have managed to dismiss all her corruption charges by bribing her way out of them, but the people of Pakistan will not forget and feel that the Red Notice issued by Interpol was spot on. It will be a sad day for Pakistan to see this corrupt leader back into our midst. We can be sure that this year, Musharraf has been reeling and dealing with Benazir Bhutto and Nawaz Sharif in an attempt to conjure up a plan which allows him to retain the Presidential seat in exchange for the seat of the Prime Minister. It has been rumored that of both the corrupt leaders Benazir was the favored of the two which would guarantee Musharraf an extended stay in power. Today there are reports that the NAB Special Operations Division Head Hasan Nasim Afzal (GEO.tv video)whose agency had been directly responsible for the ongoing investigation of the numerous corruption cases against Bhutto and Zardari has been transferred to another location. This critical move which will favor Benazir comes at a very critical juncture and can be seen with suspicion since Islamabad is already abuzz with the ongoing Supreme Judicial Council hearing to decide the fate of the Chief Justice of Pakistan. It could very well be the start of the preparations which seem to lead to an eventual acquittal from all outstanding charges literally white washing everything hence lubricating a free entry into the country and maybe heading for a third term at the office. The people of Pakistan have tried this leadership twice and each time she was kicked out primarily on charges of corruption literally across the board (link), and her husband Asif Zardari was right in the middle of the mess, popularly known as Mr 10% also had an even more extensive corruption list on his dossier. When Benazir was dismissed for the first time in 1990 President Ghulam Ishaq Khan filed six references against her alleging corruption and misconduct. None of these were decided during Nawaz’s first tenure (1990-93). So, when Benazir came back for her second round she naturally had herself acquitted on all charges. The country lost; the people lost. When Benazir was thrown out in 1996 for the second time, charged with corruption and malpractices, and Nawaz came in for his second bout with the nation one thing he did do was to manage in 1999 to have a high court convict both Benazir and Asif. Asif is in prison whilst Benazir has embarked on a world lecture tour, posing to be as pure as the proverbial driven snow. Both have appealed to the Supreme Court against their conviction and this appeal is to be heard at the end of this month. Its important to refresh our minds of their rampant corruption that we were all a witness to during her two tenures as the Prime Minister of Pakistan. Simply having the massive list against her name should seriously worry us about allowing her to take the office for the third time, which we all know would be no different then the previous occurrences. I’d like to talk to a person who believes she has turned a new leaf and will go corruption free, I on one hand have serious doubts about allowing her to run my country. 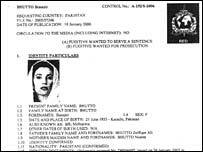 Have we not a single person amongst the 160 million people, that we have to see the likes of Benazir Bhutto again, also to call a leader the person who has been handed an extensive charge sheet for every time she stepped into office, have we not a single soul that can salvage Pakistan from this impending doom, Have we no one !!!! Pakistan is a land of miracles – a twilight zone where strange things happen. Disappointing it is but the reality is that she is going to be back soon. If she leads then it will prove the fact that “we” deserve her leadership. After getting kicked out again she may write her final book and in the epilogue she will claim to be a virgin. Perhaps, a fasrsighted poet may start to pen an elegy for this country…. I pray that this woman does not comes into power again. She looted Pakistan twice, she will do it again. I will echo Dr. Awab’s last paragraph. Do we really have no other person in a nation of 160 million who is a leader? Well written article, Dr. Sahib. Can I cross post it on my own blog as is? This coming and going will cotinue as it had in last two decade. Our politics is a cesspool and our politicians (who comes in all shape, size and UNIFORM) are eqully dirty. Hope lies not in coming back of a one or another politician, it lies in going back of army to barracks. But sadly that is not going to happen ever. Every country has a army but Pakistan army has a country. While I agree with your blog, the current government is no worse. MQM is taking 22% per contract, be it construction projects, other procurement or the current polythene bag scam (word is AH needs Rs. 200 million and they’ve collected Rs. 130 million already from the bag manufacturers… once they hit 200 the ban will be reversed). I think the only person currently able to clean up the government, perhaps, is Imran Khan. But with Musharraf around, probably rigging the polls for Benazir, and America wanting its way, and illiterate & poor voters swayed by money and brute force, I see no hope. All we in Karachi can hope is that this MQM government complete all the road and sewage projects so at least our daily commute can improve. I don’t see any harm in Benazir getting re-elected. From a pure relativity point, if all are corrupt at least she has the courage to show her true self without hiding. She has the confidence to wear a miniskirt and then accept it as her life style when asked about it…..i say she is a brave woman and that’ what we need an iron lady who is bold and confident. no we do nt have any leader in this 160M nation had we nay he would be there ……leaders do not live in hybernation and wait for the nice political weather to come.A leader has to make atmosphere for him..so ..Als..we have no leader.I hate the two ex prime ministers. what i find hard to fathom is that people with known legal criminal records in our country are allowed to run for office. there should be a legal law stating that anyone with any offences shouldn’t be allowed to run for office. I have read some comments and I would like to share my comments through this blog. I would say that there is no space for Benazir,Nawaz, or any other political so called leaders to loot Pakistan. Only Mr. Imran Khan is to test now, because he may be capable to be in Government otherwise I would say that present regime is better working if choudhries are removed.